Susannah C. Drake, Principal of dlandstudio in New York City, received a 2005 Fitch Mid-Career Research grant to study the work of Beatrix Farrand. Drake’s project studied Beatrix Farrand’s use of campus landscape design to accentuate campus architecture through the use of plants. 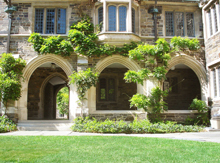 This interplay between architecture and landscape was a common thread throughout Farrand’s campus landscape work at Princeton, Yale and the University of Chicago. Drake’s project examines the original design vision, implementation, intended maintenance and life cycle planning, the current function and aesthetic and spatial sensibility of the original design and the institutions’ plans with respect to the preservation and evolution of Farrand’s landscape planning legacy.